Kudos to Arizona Sen. John McCain. After appearing as cooked as a Thanksgiving turkey just months ago, the scrappy Republican with more stayting power than a Manhattan cockroach won his party's nomination after trouncing former Gov. Mike Huckabee in Tuesday's Texas, Vermont, Ohio and Rhode Island primaries. Give him credit; he's a fighter. It's nothing short of a miracle that he's headed to the national contest in November. But he's gotta stop saying "My friends" every 60 seconds. In his victory speech he said it at least eleven times in about twelve minutes. And it's driving me f*****g batty! It's gotten so pronounced and predictable that, as he approached the stage, I said to my companion, "Let's see how many times he says "My friends." We counted aloud, with laughter, each time the words were uttered. Are we really gonna have to listen to this until November 4th? Worse, should he win the presidency, will we be forced to hear "My friends" for the next four years? I don't think I can endure such punishment...certainly not after eight years of hearing Bush's embarassing malapropisms. "Hello Houston! My friends, we're here victorious tonight thanks to my Ohio friends who, along with my friends in Vermont and my friends in Rhode Island, joined all my friends in all the other states who, as my friends, have voted for me since January, which is what I had counted on my friends to do. My friends, thank you." 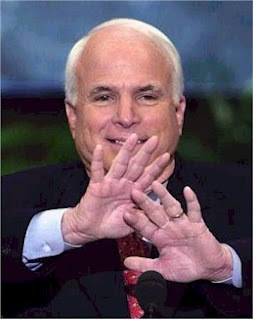 Does McCain not have handlers? Speech writers? People who can, gently, take him aside and say..."My friend, knock it off with the 'my friend' business...it's getting stale and making you appear like a programmed GOP dinasaur. On another note, we could use your help at The The Adrienne Shelly Foundation. We are a tax-exempt, non-profit organization dedicated in my wife's honor to help carry out her spirit and passion, with the goal of assisting women filmmakers. Adrienne was brutally killed in NYC on November 1, 2006. Through the Foundation, her commitment to filmmaking lives on. We've established scholarships, grants, finishing funds and living stipends at NYU's Tisch School of the Arts/Kanbar Institute of Film; Columbia University; American Film Institute; Women in Film; the Independent Feature Project; the Nantucket Film Festival; and the Sundance Institute. Your generous contribution will go a long way towards helping us achieve this very important mission. Thank you. Ok, Andy here is how we survive a McCain presidency should that happen. Whenever he says "My friends" we take a shot of Tequilla (or your poison of choice). For all you teetotalers you might want to reconsider. We'll need it. Go to your fridge. If you have a beer chug it down. If it doesn't take the edge off the "My friends" annoyance -- drink another. If the beer buzz isn't working you may want to consider watching You Tube reruns of "Eight is Enough." At least he's not saying, "My fella Murricans," the way Lydon Johnson used to do. these shortcomings should be brought to the attention of the American people. The "miracle" of Saint John's win is really a function of the lameness of the Republican feild and the Republican ability to pick the most electable candidate. Really who was his competition? Romney was the only one that may have had a chance, but there was no way in hell the R base was going to vote for a Mormon. So don't give the old fart too much credit. If Hillary is the Democratic nominee we at least won't have to listen to "my friends" for eight or minimum four years. All she has to do to win against him is for her campaign to continually show the picture of Bush and McCain kissing after Bush humiliated McCain during their election race. That proves McCain is certainly not a fighter. Of course if Obama is the nominee the Repugs will smear him so badly that no one will notice the "kiss." When he says "My Friends" I am reminded of the speech the wizard of oz made as he and Dorothy were preparing to leave oz in the balloon. His first words ar "my Friends". McCain sort of looks like the wizard. It may be a little old-fashioned, but personally I rather like it. It sounds like civility, a tone I'm appreciating more and more as this political season wears on (and on...and on...). That simple politeness is a refreshing change from both the rhetorical roller-coaster rides and shrill posturing which seem to be all over the news.